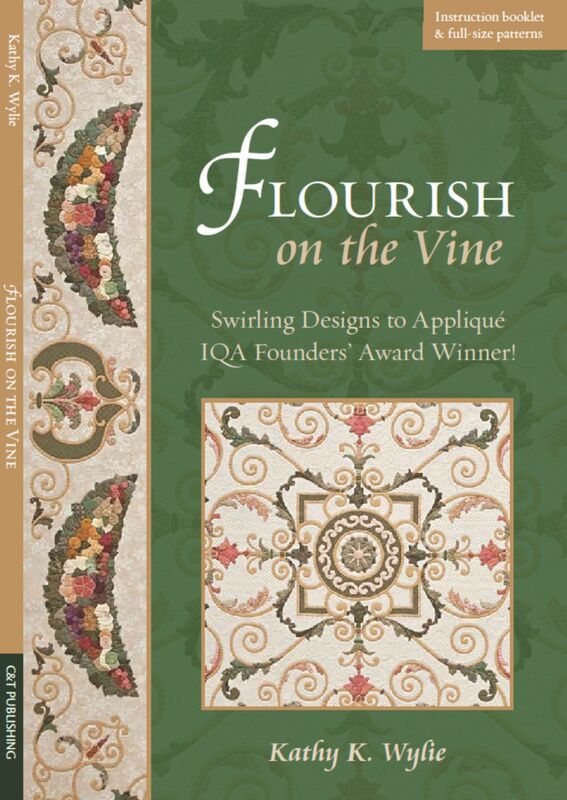 Just a year after receiving the IQA Founders’ Award for Flourish on the Vine, I am pleased to present the complete pattern for the quilt. 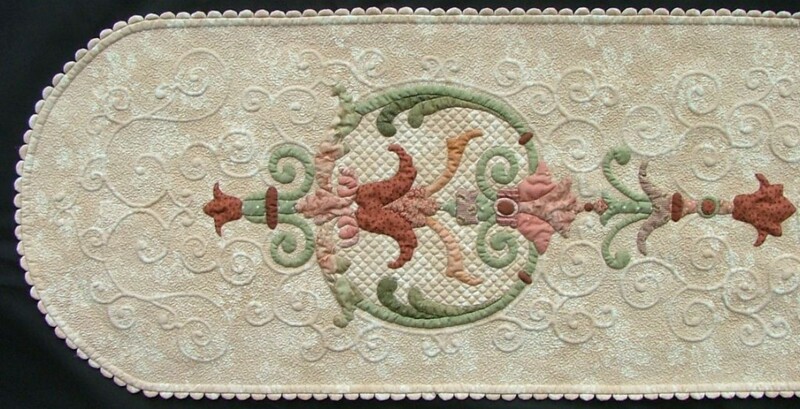 It has been published as a Pattern Pack by C&T Publishing – a unique format ideally suited for detailed appliqué designs. The quilt is appliquéd in twelve sections. Section 1 is the center medallion and Section 3 is the vertical axis of the center panel. On their own, these two sections make a great table runner design that measures 12″ x 56″. 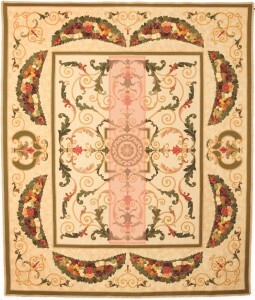 To make a long table runner with flourish, cut a piece of background fabric 16″ x 60″. The background is over-sized and will be trimmed after the appliqué is complete. Fold and press the background fabric in half vertically and horizontally to mark the centers. Using the Section 1 template patterns on pattern pullout page P1 of the Flourish on the Vine Pattern Pack, trace just the circle portion of patch 1.12, matching the centers. The remainder of Section 1 inside the circle may be marked for appliqué or quilting or left blank. In the sample, I machine quilted patches 1.1 to 1.8 even though they will likely be covered with the table centerpiece! Using the Section 3 template patterns on pattern pullout page P3 of the Flourish on the Vine Pattern Pack, trace and appliqué patches 3.1 to 3.35 and patches 8.26 to 8.28 on either side of the circle, matching the vertical center. 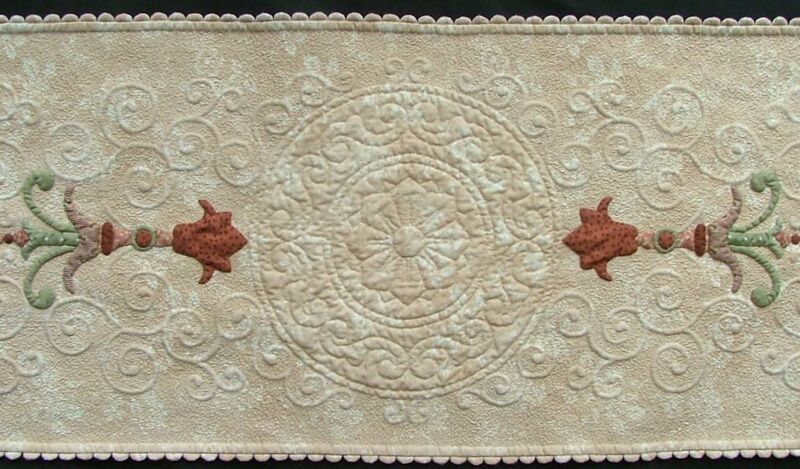 For more information about marking and needle-turn appliqué, see pages 3 – 6 in the pattern pack instruction booklet. Layer the quilt top with batting and backing fabric and baste. Quilt in the ditch around the appliqué and add vines, stippling and cross-hatching in the background areas as desired. Wash the completed quilt to remove any markings and lay flat to dry. 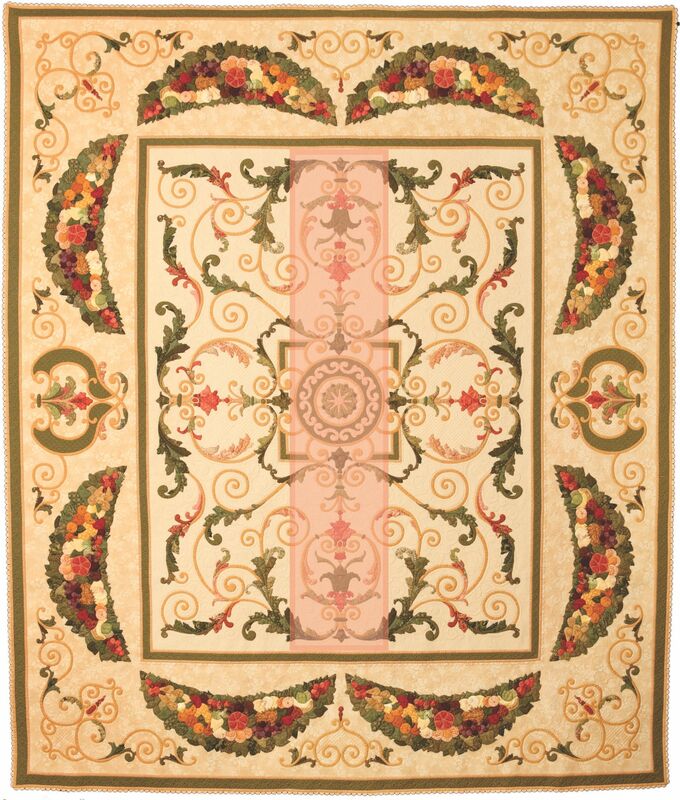 Trim table runner to 12″ x 56″, measuring 6″ and 28″ from the centers and rounding the corners. To add a decorative clamshell edge finish to the table runner, consult the instructions on page 15 of the pattern pack instruction booklet. You will need approximately 270 1/2-inch clamshells. To order the Flourish on the Vine Pattern Pack, please visit my web store or C&T Publishing. The pattern is $17.95 and will be available 12/10/12. So looking forward to your workshop with our group in June.